Our goal is to keep you educated on all of the latest and most relevant news pertaining to hot air, hot wedge, impulse and rotary adhesive technologies. QuickSync Visual – What is it? SS71 Bonding Tape is made for the clean assembly of awnings and marine products to create smooth, waterproof seams and eliminating the need for thread matching. The tape is available exclusively for purchase from Trivantage, the nation’s one-stop shop for fabrics, hardware and accessories. SS71 Bonding Tape is designed to work with Sunbrella®, Sunbrella® Plus and FIRESIST® fabrics. It is available in a standard 7/8” width, however additional custom widths may be purchased from Trivantage by special order. Recently, Miller Weldmaster displayed two machines at the Pack Expo International in Chicago – the PS150 top closing system and for the first time, the PS300 back seam sealer. Both are designed for Poly-woven, thermoplastic and paper bags. Double-wall fabric, also known as Dropstitch, is an incredible high tech, three-dimensional fabric. It is constructed of dual fabric layers that are bonded together with thousands of polyester threads to create a single, incredibly strong textile unit. These fabrics are used to manufacture inflatable products that are lightweight and easy to transport, yet strong, stable and rigid. Heat seaming equipment manufacturer Miller Weldmaster partnered with FASTSIGNS to distribute school bags to local students and introduce its latest hot air welder at the Outside Sales Summit in St. Louis. FASTSIGNS is a leading sign, graphics and visual communications company, with 660 franchised centers located in nine countries. Each year the company brings over 400 outside sales professionals together for a sales summit and trade show exposition to learn about the latest innovations and products in the signage industry. During these sales summits, FASTSIGNS strives to leave a positive impact on the local community. This year they provided back-to-school bags for Peabody Elementary School, located in downtown St. Louis. 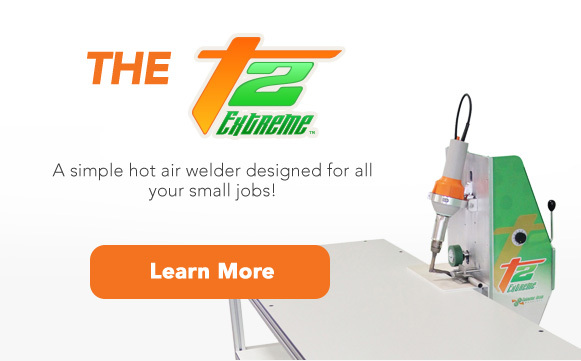 In addition to participating in the community giveback project, Miller Weldmaster also exhibited its new T2 Extreme at the sales summit.